Despite the fact that so far there’s only a drafted version of the IEEE 802.11ac standard, network equipment vendors already offer users their products that support this draft. 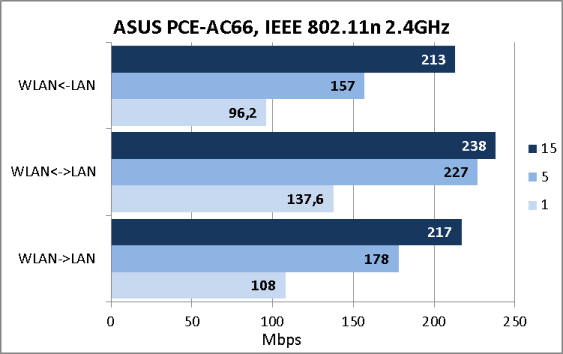 We’ve already tested ASUS RT-AC66U and NETGEAR R6300 wireless routers working at unprecedented speeds in the wireless segment (theoretically up to 1300 mbps), however these tests couldn’t be called full-fledged as there one of the routes was actually playing the part of the wireless client. 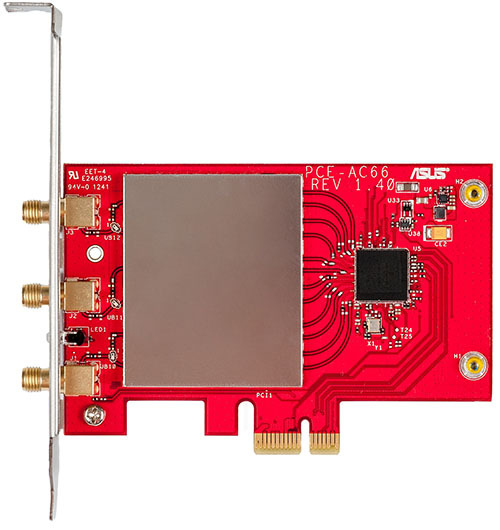 Today, in our testing lab we’re hosting an ASUS PCE-AC66 PCI-E card that allows connecting desktops to the new generation wireless network. 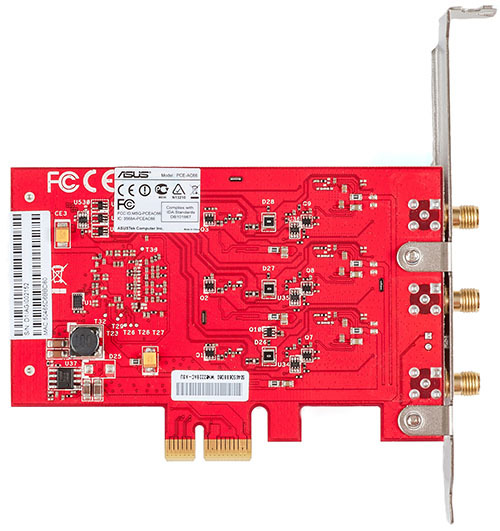 The ASUS PCE-AC66 network adapter is a red textolite board whose dimensions are 104X69X21 mm. Together with the device itself come detachable antennas and a magnetic external base for more comfortably placing them near the computer. The second bracket allows installing PCE-AC66 into low-profile cases. 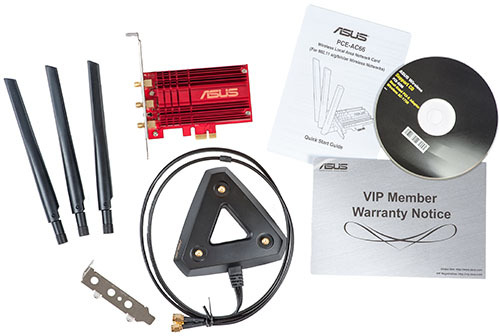 The ASUS PCE-AC66 model is based on a Broadcom BCM4360KMLG chip hidden under a massive radiator. 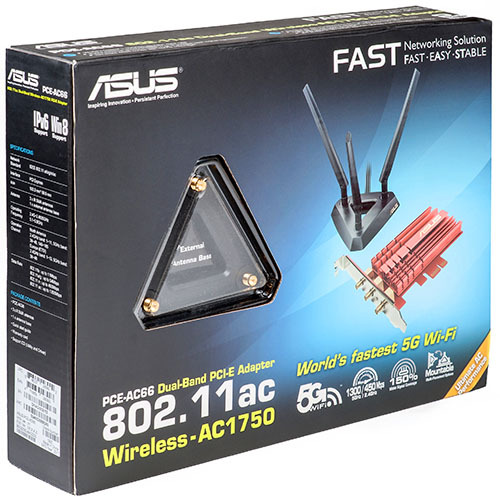 We’ve already seen such chip in the NETGEAR R6300 router; the fact that ASUS has given up the use of active cooling removes another point of possible failure – the cooler. 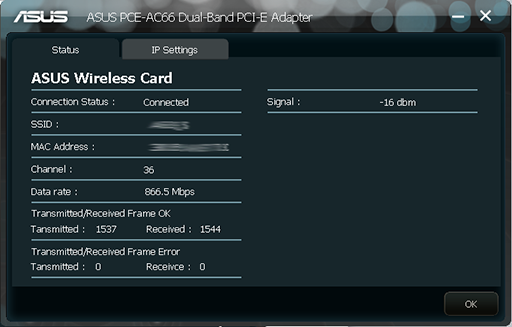 Now let’s see what the wireless network adapter at hand is capable of. Together with the card comes a CD with drivers and a managing utility. It’s worth noting that they are also available for downloading from the vendor’s website. 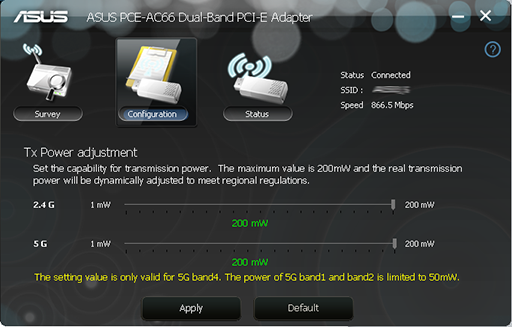 Right after starting the ASUS PCE-AC66 WLAN Control Center utility depicts a list of available networks and their main operation parameters. 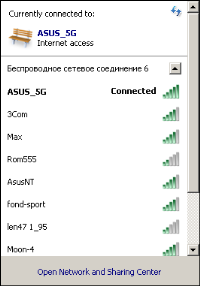 If you’re already connected to some wireless network, you’ll see its SSID and the current connection speed. 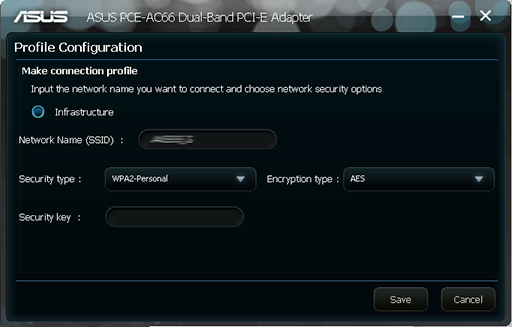 Unfortunately, ASUS PCE-AC66 WLAN Control Center is available only in English. When trying to connect to protected networks the utility will demand additional data. The Configuration button allows setting the wireless transmitter power. 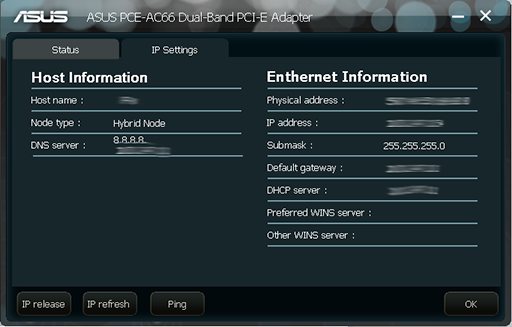 The Status item gives the user information about the IP-parameters of the currently connected wireless network. 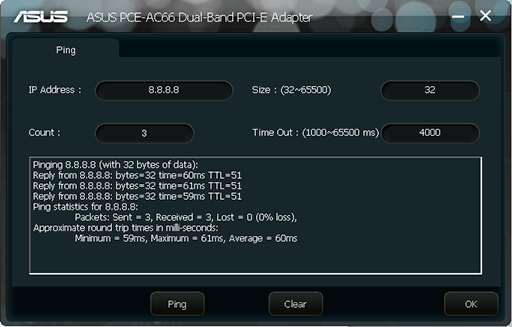 Here the user can refresh them and ping the network by sending ICMP echo-requests. 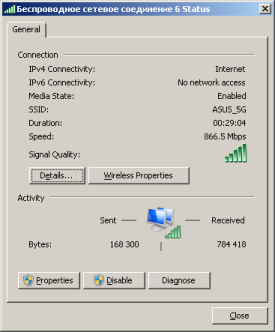 In the Status tab one can see additional information regarding the work of the current wireless connection. To be fair, we have to mention that the user can configure everything with the help of standard means of an operating system. Now let’s move on to the testing section. To measure the performance we used the JPerf utility version 2.0.2. 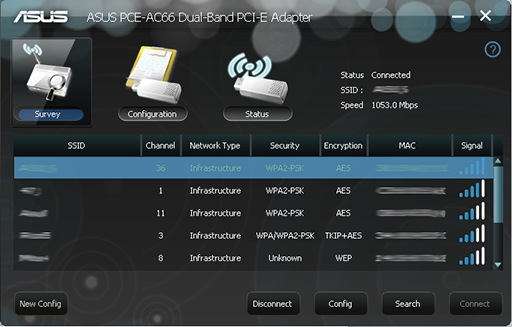 We connected to an ASUS RT-AC66U wireless router. The main parameters of the testing stand are presented in the table below. 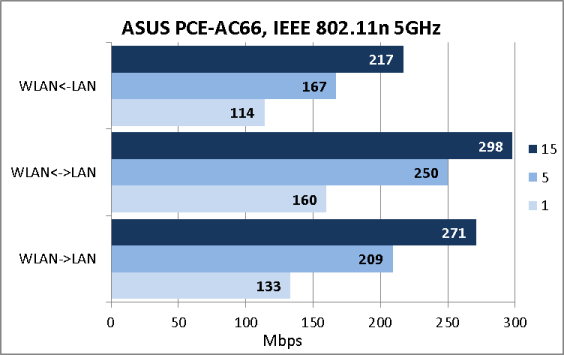 First, we decided to determine the speeds of the device in the 802.11n network in both frequency ranges. Then we reconfigured our wireless devices for work with the 802.11ac draft. The obtained results are impressive in both cases. When working with 80 MHz channels we almost overstepped the psychological boarder line of 500 Mbps. Here we’re through with this unusually short testing section and are going to make our conclusions. 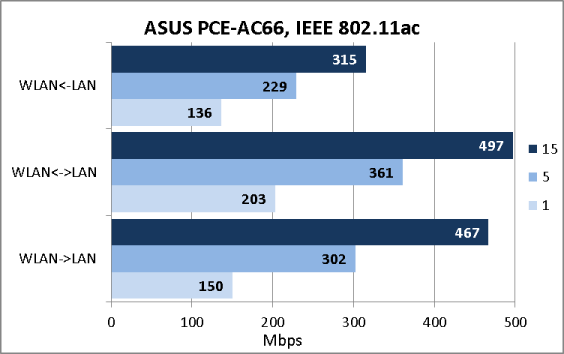 On the whole we were happy with the ASUS PCE-AC66 wireless network adaptor we tested; however, this was the first NIC in our testing lab that supported the draft of the IEEE 802.11ac standard, so we had nothing to compare its capabilities with. The advantages are listed below. When the article was being written the average price for ASUS PCE-AC66 in Moscow online shops was 3100 RUB.